What Imports into the U.S.
As the president-elect prepares to enter the White House, foreign imports into the U.S. have become a leading agenda item. 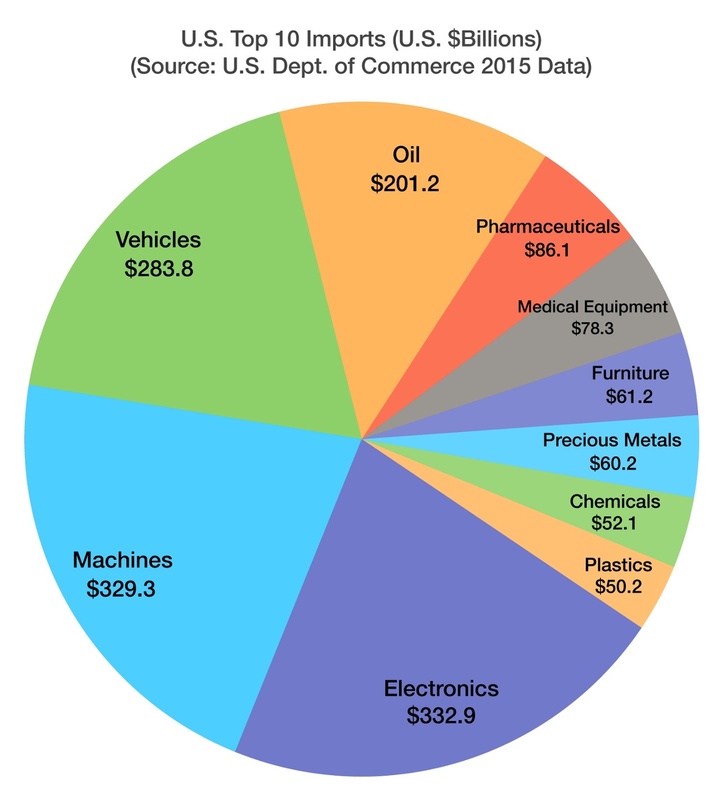 According to the Commerce Department, the top imports into the U.S. include electronic devices such as mobile phones, computers and TVs, followed by machinery and automobiles. The onset of additional tariffs and import duties might change the makeup of imports dramatically, as consumers tackle higher prices along with some manufacturing possibly shifting to the U.S. The biggest question everyone has is how higher tariffs will affect U.S. consumers and the economy. The most dominant imports currently tend to be high-margin products such as mobile phones, laptops, and computers. Any additional tariffs might either be partially absorbed by the exporters or passed along to consumers in the form of higher prices. What’s interesting is that the onset of cheap Chinese-made products has actually altered consumer behavior in the U.S. over the past twenty years. Before inexpensive TVs made their way into electronic superstores, a typical TV would last years. Today, TVs are considered disposable and easily replaced. Should import prices rise, consumers might reconsider replacing products regularly, and instead maintain existing products for longer periods.